I have never been one to make my own salad dressings. In fact, I thought that people who did were just overachievers. Not that I’m not an overachiever (hello I make all of my own bread), I just thought that going to all the trouble of making a salad dressing that wasn’t going to last as long as bottled dressing was just a waste of time. That said, the dressing was what drew me to this recipe, and when I made it on New Year’s Eve, it was a huge hit. But even after making the dressing and having my family devour it, I still wasn’t convinced that homemade salad dressings were the way to go. So then why am I about to share a recipe for a homemade vinaigrette? Because on Sunday, as I was preparing my menu plan and grocery list, I realized I had a lemon on my counter that was on the verge of going bad. Everything I make using lemons either requires more lemons or more ingredients, and since I’m trying (and failing) to only spend $25 a week at the grocery store, I need to make something using ingredients I already had. I remembered watching someone on The Food Network (Ina probably. Or maybe Rachel Ray, but I tend to avoid her as her brightly colored kitchen scares me a little.) 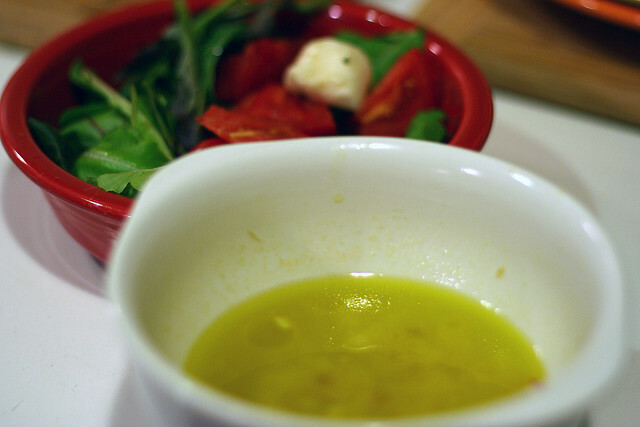 make a salad dressing using lemon juice and olive oil, so I decided that a salad would go well with my dinner. A quick Google search yielded a lemon vinaigrette that was so delicious, I knew instantly I had to share it with you. Squeeze your lemon juice into a small bowl (or the bowl you are going to be serving your salad from – no reason to dirty up two bowls). Use a microplane grater to grate your garlic clove into the bowl with the lemon juice; make sure to check the back for any remaining garlic. Zest your lemon and add the mustard and sugar. Whisk to combine and then slowly mix in the olive oil. Use extra virgin here, even if you usually don’t. You can really taste the difference between good olive oil and oil that’s better for cooking in a dressing like this. Whisk to combine and season with salt and pepper. Toss with your salad or store, covered, in the refrigerator for 3 days. Cute post – couldn't agree more about Rachel Ray! Non sequitur: I feel like we should collaborate on how to get the grocery budget to average $25/week… I have the same problem! This looks simple and delicious. I actually never buy dressing. It's usually full of artificial ingredients and doesn't taste anywhere near as good as the 'real' stuff. Thanks for a great looking recipe! Next post: Welcome to My New Home!